Groundbreaking Shovels For New Jersey Top Our List! For years the beautiful Garden State has been steadily clearing, building, and growing - especially Hudson County. It's no wonder that groundbreaking shovels for New Jersey top our list of shipments! CeremonialSupplies.com is dedicated to offering finely crafted, high quality products for festive celebrations, including groundbreaking ceremonies, grand openings, military functions, and many others. We ship all over the world. New Jersey, with over 6 billion in investments last year alone, is churning more new businesses, and new business ventures and opportunities. This could be the reason why we'venoticed a spike in groundbreaking shovels shipped to New Jersey. It's impossible to find a spot in the Garden State that doesn't have an event of historical significance attached to it. New Jersey, one of the original 13 colonies of pre-revolutionary times has a rich history. For an event planner, this is a golden opportunity to tie the theme of an event, let's say, a groundbreaking ceremony or a grand opening, with historical facts of the location where these events will take place. For instance, there were 296 battles (including the decisive battles of Trenton and Princeton) fought in New Jersey between the British and the Continental Army in the 1770's. Playing up the history of an event's location, especially first sod cutting ceremonies, contributes creatively toward theme development. Noteworthy personalities and their New Jersey birth towns is another way to work certain elements into your event. Some Garden State famous were President Grover Cleveland born in Caldwell, authors Walt Whitman in West Hills, and James Fenimore Cooper of Burlington, bandleader William Count Basie of Red Bank, Fran Sinatra of Hoboken, astronaut Buzz Aldrin from Montclair, and comedian Jerry Lewis and founding father and 3rd Vice President of the US, Aaron Burr, both from Newark - Aaron Burr and first US Secretary of the treasury, Alexander Hamilton fought the famous duel in New Jersey, in an area known as the heights of Weehawken, below the New Jersey Palisades cliffs. As you see, there are plenty of historical anecdotes to blend into the theme of a traditional ceremony like a groundbreaking. The ceremonial groundbreaking shovel is the star of all first sod-cutting ceremonies. Selecting the groundbreaking shovel to fit your event is an important decision. CeremonialSupplies.com offers a selection of stainless steel groundbreaking shovels designed for ceremonies. Ceremonial groundbreaking shovels have a D-style handle, and although they can in fact shove dirt, the handle is more conveniently used for photo staging. Chrome polished and chromed mirror polish are additional options available with D-style handle groundbreaking shovels. For a more traditional ceremonial shovel there's the long stem chrome blade, which doesn't have a handle becasue it can actually be used in shoveling work. Other groundbreaking shovels available from CeremonialSupplies.com are the color ceremonial shovels with blades in red, blue, green, white, yellow, orange, and pink. Our stainless steel chrome groundbreaking shovels as well as the color ceremonial groundbreaking shovels can be elegantly customized at the blade, the stem, or the handle, or on all three depending on the client's wishes. A first sod-cutting ceremony is a momentous event, and the ceremonial groundbreaking shovel, or shovels, depending on how many people will take part in the ceremony, is an item that should be kept for posterity. 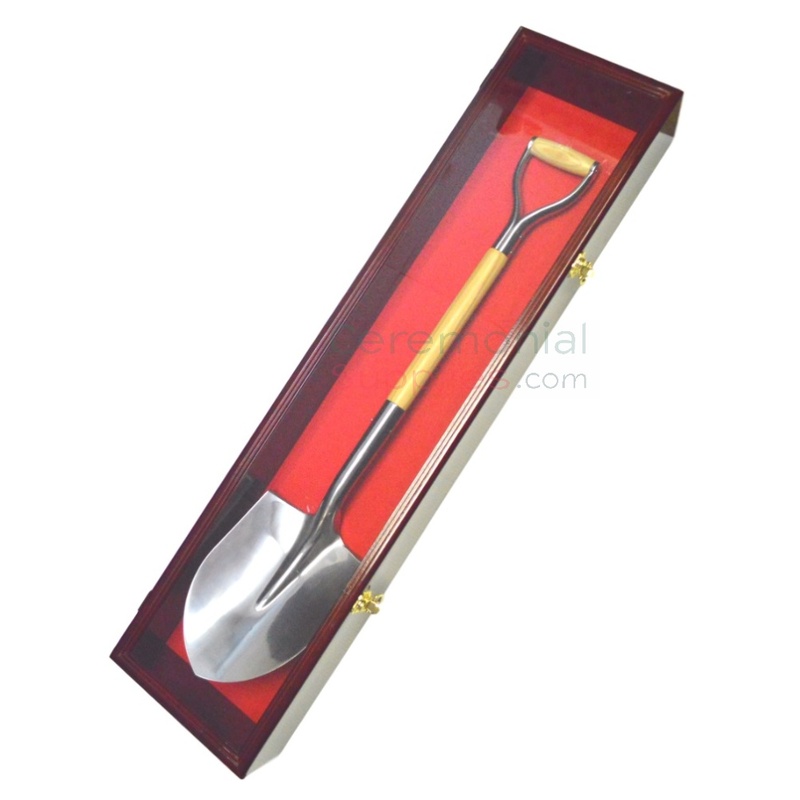 We have groundbreaking shovel stands, and wooden display cases to preserve and display the ceremonial groundbreaking shovel in a special spot in an office or home. There's never been so many options for the embellishment of a ceremonial groundbreaking shovel, so come to CeremonialSupplies.com and let us help you pick out the one that's perfect for your historical New Jersey groundbreaking ceremony! Our products are top notch quality, our customer service is personable and knowledgeable, our prices are budget friendly, and our shipping is prompt and efficient to wherever you are. CeremonialSupplies.com is the best place on the web for groundbreaking shovels, hard hats, carpet aisle runners, stanchions and rope, step and repeat banners, recognition award plaques, and so much more! Come shop with us.